Nestled between the town of Knysna and the famous Knysna Heads, lies Pumula Lodge – “the place of rest”. The lodge, with its tranquil, parkland setting where nature lovers can enjoy the abundant bird life supported by the beautiful gardens. Over 100 species have been identified. Private entrances to en-suite bedrooms each with a deck overlooking the gardens and swimming pool. “Tree-top” breakfasts, secure undercover parking, communal kitchenette and barbecue facility. Close to golf courses, bird sanctuary and restaurants. Children 10+ welcome Credit cards.Non-smoking lodge. Listed in the “Portfolio of Places”. Voted Semi-Finalist of the 2005/6 & 2007 AA Travel Guides and American Express Accommodation Awards Programme. 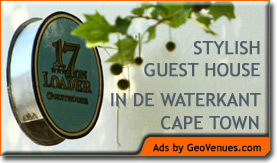 Finalist of the 2008 AA Travel Guides and American Express Accommodation Awards Programme.